Said to be one of the boldest, revolutionary artists of Italy’s High Renaissance, Correggio’s work can be at times intensely religious and at others, sensual. Born in the small town of Correggio, in Italy’s Emilia-Romanga region, the artist was named Il Correggio after his birthplace. With little known about his training, his noted influences come from Lorenzo Costa (1460-1535) who influenced the Bolognese School of painting and Francesco Francia (1450 – 1517), also of Bologna. Perhaps his most recognized influence was that of Italian artist, Andrea Mantegna (1431 – 1506), whose work in spatial illusionism greatly influenced Correggio’s ceiling frescos in Parma, Italy. Between 1506 and 1510 he stayed mostly in the town of Correggio, after some time spent in Mantua. One piece that is documented during this time is the Adoration of the Child with St. Elizabeth and John. Even here an early influence of Mantegna and also Costa can be seen in Correggio’s work. He again returned to Mantua where he completed 3 circular pieces (Tondos) for the church of Sant’Andrea in Mantua. By 1518 the artist settled in Parma, where he established his first major commissions and created his greatest works. Before and during this period he painted pieces such as the now lost work, Madonna of Albinea (1514), also Madonna and Child with the Young Saint John (1516) now in Museo del Prado in Madrid and The Rest on the Flight to Egypt with Saint Francis (1517), now in the Uffizi Gallery. His first ceiling decoration was commissioned in 1519 by Mother-Superior Abbess Giovanna Piacenza for her private dining area in the Convent of St. Paul in Parma. 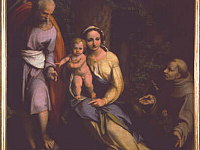 It was a clear indication of the complex and inventive style that established Correggio as somewhat visionary, not having any definitive influence preceding the style. The closest influence was that of Mantegna, but Correggio seemed to take these illusionist perceptions of space to whole new levels. Still his style did not become entirely apparent until his work on the dome of the San Giovanni Evangelista church, also in Parma, titled Vision of St. John on Patmos, created 1520 – 1521. 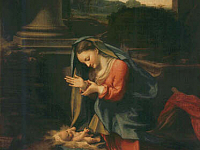 His artistic revolution then culminated in his work at the Cathedral of Parma, in the famous, Assumption of the Virgin. The towering illusion of layers of human figures seem to be transcending up into the heavens, using a technique called Sotto in su, which means ‘seen from below’, which Mantegna is attributed with using first. 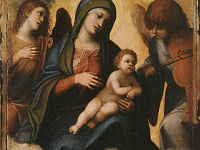 Correggio had used the technique in his earlier dome frescos, but not to the same climactic effect seen in the Cathedral of Parma. His frescos were undoubtedly original, but his paintings, The Lamentation and The Martyrdom of Four Saints, also presented unseen aesthetic in Italian painting influential to later artists. Correggio’s more sensual works were created at the pinnacle of his career, seen in his Mythological depictions, such as Jupiter and Io, Leda and the Swan and Venus and Cupid with a Satyr, part of his now famous series, Loves of Jupiter, (1530 – 1533).